At Kitchen Kleen, we’re continually trying to meet the needs and demands of today’s produce consumer and produce manager. 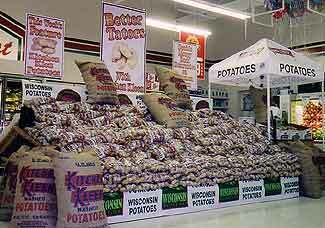 Many studies have shown that potatoes are America’s favorite vegetable. Potatoes taste good and are versatile. Potatoes are also low in calories and are high in vitamin C – an overall excellent nutrition source. According to the National Potato Board, 85% of consumers keep fresh potatoes on hand and potatoes are served four times as often as any other side dish. Consumers are looking for products and packaging that communicates a benefit. As you know, Kitchen Kleen bags and boxes clearly communicate several consumer benefits – from Certified Environmentally Grown to Double Washed to Recipes on the Web. We take great satisfaction in providing our consumers a great tasting product. 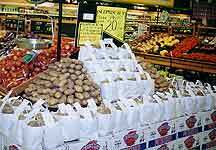 We also pride ourselves with providing produce managers with a quality product as well as useful point of purchase materials. 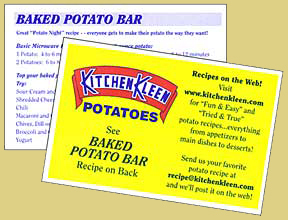 Last year’s Kitchen Kleen “When is your potato night?” floor graphic was very popular as were the Kitchen Kleen bright yellow recipe cards (download pdf). 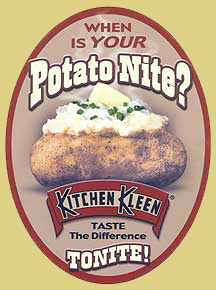 Kitchen Kleen Potatoes are available from mid-October until June each year. 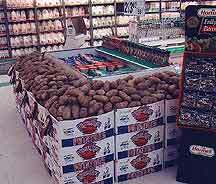 We pride ourselves with providing a quality, great tasting potato and you know you will always get a great tasting Russet Burbank potato with Kitchen Kleen. 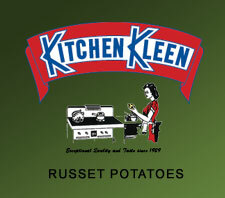 Kitchen Kleen Steamin' Spuds are now available. Contact us for more information. Contact Us To Get One Today!